Tax season tends to sneak-up very quickly after the holidays so we’ve looked at the very best tax software for Mac & PC to help maximize your refund in 2019. If you already manage money on your Mac with some of these excellent personal finance tools or use investment optimization apps like the excellent free Personal Capital, tax preparation is easier. If you don’t though, a tax filing app makes things a lot easier to meet the April 17th deadline so we’ve covered everything here from small business tax software for Mac and PC users to solutions for S-Corp filing. Note that all the programs featured here are for filing taxes in the USA and Canada only and all are compatible with the latest versions of macOS including High Sierra and Mojave. Here then are the top 5 tax software for Mac and PC in order of ranking. TaxSlayer is an easy to use, no nonsense tax filing software that offers some of the most competitive prices on the market. TaxSlayer also offers a $1000 refund advance within 24 hours of filing your tax return. To receive this, you must also apply for a TaxSlayer prepaid Visa card and the $1000 will be deposited on the card pending certain conditions. The $1000 loan amount will then be automatically deducted from any federal tax refund issued by the IRS. TaxSlayer promises to maximize your return and has a simple pricing model depending on your needs. If you’re just filing a simple tax return, TaxSlayer is completely free including for both federal and state taxes or Form 1040 EZ. TaxSlayer has an extremely clean and easy to use interface which doesn’t feel bloated or overwhelming like a lot of tax filing apps do. TaxSlayer also has a simple pricing structure that’s easy to understand. TaxSlayer Simply Free for anyone filing a form 1040EZ; Classic for all major Federal forms and fast W-2 imports; Premium for VIP Support and tax help and Self Employed for Contractors, Freelancers and 1099s. Note that the Classic version of TaxSlayer doesn’t deduct simple things such as charity donations, rental properties, sale of home etc although the Premium version can deduct some of these. It also has a special version for military personnel tax returns. If you want a quick and easy way to file taxes on your Mac, TaxSlayer is about as cheap and easy as it gets. You can start filing for free with TaxSlayer straight away and to ensure the security of your logins, it will verify your account via SMS to your mobile. Along with TurboTax (see review below), H&R Block or “Block” as it’s more commonly known, is probably the most widely used tax software out there. The most unique feature of H&R Block is that it has over 12,000 physical offices around the US where you can actually talk face-to-face with a tax specialist if you’re having problems. Anyone that has spent hours on the phone to for any kind of software support will vouch for how much stress and hassle this can potentially save. HR Block is therefore ideal for small business owners that may have slightly more complex tax returns, especially because you can see someone face-to-face to have a look over your finances in one of their offices. Another plus is that H&R Block offers an advance refund of up to $3000 if you consult one of it’s tax advisors. You have to apply for a H&R Block Emerald Prepaid Mastercard but the advance refund can be on the card within 24 hours pending certain conditions. Note that the amount granted is simply a loan based on the size of your refund that H&R Block calculates. The most basic version of HR Block costs still contains all IRS forms unlike TurboTax that has now removed many tax forms from its equivalent basic version. You can file Federal taxes for free however with H&R Block online Free Edition which provides everything, including free tax advice at no extra cost like all H&R Block products. Another useful feature is that if you’ve already got data stored in TurboTax, you can import it into HR Block. There are 4 version of HR Block available – Basic, Deluxe, Premium and Premium & Business. All of these are available either as an online version (which is slightly cheaper) or as a desktop download. All versions advise you where can make deductions to help maximize your refund and offer tax advice over the phone from a professional. The differences between each one follow a similar model to TurboTax but with slight differences. The Basic version is for those with simple tax returns. It can import your W2, 1099 and previous year’s tax return from TurboTax. It will also do Schedule A itemized deductions and includes Refund Reveal – a useful tool which explains and shows exactly how much you can expect to get back. The Deluxe version is necessary for homeowners and investors to complete e-filing. It includes all the features of Basic plus guidance on home and mortgage interests and help with investments and dividends. The Premium version includes all of the Deluxe but also supports all Schedule C returns for small business owners and schedule E returns for rental property income. The Premium is the complete business tax preparation software for small business owners but also includes corporate, partnership and LLC returns. It can also generate payroll and employer forms. However, Premium & Business is not available for Mac – it’s Windows only. Audit Protection: H&R Block will take care of administration of any audits caused as a result of filing with it’s software. Note that this is not a protection against being audited by the IRS. Secure Connections: H&R Block uses several layers of security protection when it comes to filing online. W2 Finder: Like TurboTax, you can also file online using your iOS device such as iPhone or iPad and take pictures of W2 forms. H&R Block however can even look-up your W2 form for you. In terms of price, the Mac desktop versions of H&R Block are marginally cheaper than TurboTax although the respective versions aren’t exactly the same. H&R Block has gained much ground on TurboTax in recent years. The differences between TurboTax and H&R Block are increasingly minor but H&R Block offers the big bonus of face-to-face customer support in a physical office at no extra cost. It also promises to refund you in case of any mistakes that can be proved were caused by the software and H&R Block will even handle any audits requested by the IRS as a result of using the software. TurboTax has slightly more attractive form wizards and interface touches but H&R Block still looks good and does the job very efficiently indeed. If you want the peace of mind of being able to see someone in person if there’s a problem with your taxes, or want to switch and import data from TurboTax, you can’t do any better than H&R Block. Intuit’s TurboTax still remains the most widely used tax filing software out there although it has faced stiff competition from H&R Block in recent years. TurboTax is made by Intuit which originally created the much maligned Quicken for Mac. The lack of features in Quicken for Mac compared to the Windows version meant many Mac users ditched Quicken in favor of better alternatives but fortunately, TurboTax is the same on Mac as it is on Windows. However, TurboTax is still a very easy to use and comprehensive tax software that has over 350 tax deductions which double checks your tax returns and guarantees 100% accuracy in calculations. There are four different versions of TurboTax: Federal Free, Deluxe, Premier and Self Employed. 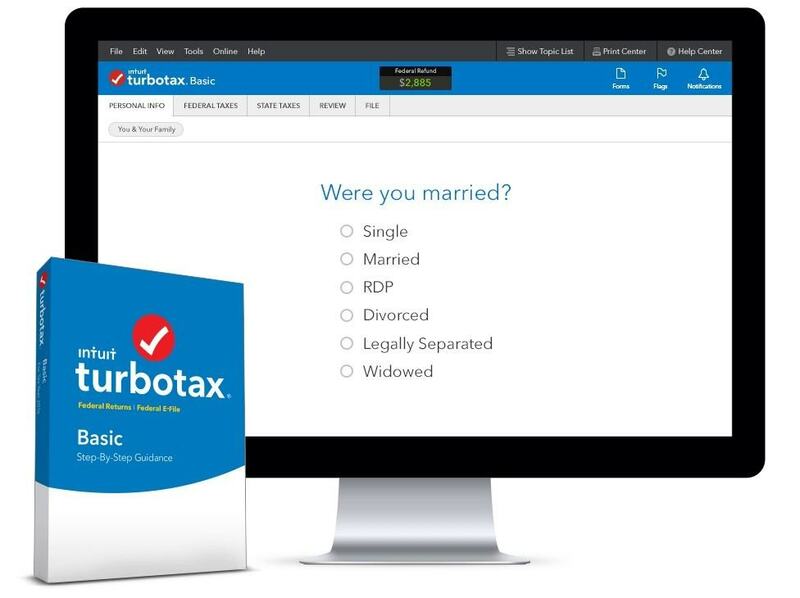 In 2019, TurboTax has also introduced TurboTaxLive. This gives you the option of having a real CPA and EA review your tax return but this generally adds an extra $20 onto the cost of each package. You can also talk to them but this is done online via screen sharing whereas H&R Block has physical offices around the country you can go into. Here we take a closer look at the different versions of TurboTax. You can file for free with TurboTax if all you need is to make simple 1040EZ/1040A tax returns. This version allows you to prepare and e-file both federal and state taxes. Although federal filing is free, some states require a fee for filing. To get TurboTax Federal for free, you must simply subtract the fee from your federal tax refund and have the balance of your refund deposited directly to your bank account – you don’t need a credit card either. The Deluxe Edition of TurboTax is the most popular version and includes all the features in the Federal Free Edition with the inclusion of access to basic deduction identification tools and improved support. Deluxe claims to maximize your tax deductions by identifying more areas where there are industry or occupation specific deduction opportunities. There are also enhanced tools for things like inheritances, donations and audit risk protection. However in 2016 Intuit removed Schedule C and D tax returns from the Deluxe Version and packaged it into the Self Employed Edition (then called “Home & Business Edition”). This means that the Deluxe version is no longer suitable as an LLC tax software anymore. TurboTax Premier Edition gives you full access to all features of the software with deduction assistance that includes support for rental properties and other business-specific tax deductions. It also has advanced calculators and additional investment resources for those with stocks, shares, funds and other assets. This is now the most expensive version of TurboTax and essential for small business owners and professional tax software for Schedule B and C tax returns which used to be part of the lower priced Deluxe version. Although these features used to be part of TurboTax Deluxe, the Self Employed edition is a lot cheaper than hiring an accountant and if your returns are fairly straightforward, it’s still worth the investment if you’re going to use it regularly. To get a better idea of the difference between each version, check out the TurboTax comparison chart. While TurboTax is generally very easy to use and holds your hand closely during the process of entering your data, TurboTax can be very fussy sometimes about entering data. For example, even entering something as simple as a social security number requires endless steps walk-throughs which can make the process very frustrating. In general though, the layout and format of TurboTax is well done and there are easy to follow deduction tools. TurboTax makes it very clear how to fill in your returns and there are some nifty little features such as “W-2 Snap & Autofill” which allows you to take a picture of your W2 on your Mac or iOS device and upload it. There’s also a feature called “SmartLook” which automatically connects you to one of Intuit’s tax specialists if you have a tax doubt or question. This is bolstered with an “ExplainWhy” feature which helps explain certain fields and requirements in your tax return. For personal income tax returns, TurboTax has an easy to use and comprehensive Federal Free Edition that includes 1040EZ, 1040A, and 1040 forms including live chat support. There are other useful features of TurboTax to give you peace of mind too. Accuracy Protection means that if TurboTax calculates your taxes incorrectly, Intuit will pay any fees or money owed to the IRS. It also offers three levels of audit protection – Audit Risk Meter, Audit Support Guarantee and Audit Defense. The Risk Meter appears while you are filling out forms to show you if there are any potential problems with your form. Audit Defense means that Intuit provides full tax specialist and legal support if you are audited as a result of a tax return completed with TurboTax. There’s also something called MAX which is an enhancement to Audit Defense and includes things such as Tax Identity Restoration and quicker response times from Intuit. TurboTax is still the most widely used tax software out there although it has lost ground in recent years to H&R Block, partly due to its pricing policy and removal of features from cheaper versions and putting them in more expensive versions. TurboTax also requires you to pay more for features that come with the price of the software in H&R Block such as Audit Defense and MAX. Note that there used to be a free TurboTax desktop app from the Mac App Store but this is no longer available. The negative press surrounding incidences of TurboTax fraud in 2015 has no doubt also damaged confidence in the product although in an effort to reassure customers, TurboTax has focused on significantly improving security. Overall though, TurboTax is easier than ever to use and if you don’t need the peace of mind of being able to speak to someone face to face about your tax filings, TurboTax is still a good choice. Until 28th February 2019 you can also get $20 off any purchase of TurboTax. Note that if you’re based in Canada, you need to use the Canadian version of TurboTax (currently 15% off). TaxAct is probably the most popular online alternative to both TurboTax and H&R Block. It does not have a Mac app but it offers a very competitive online service that Mac users can use. TaxAct also offers a $100 gift card bonus for selected retailers if you’re willing to put part of your refund into gift cards. TaxAct definitely has a look and feel that’s clearly inspired by TurboTax and H&R Block but is considerably cheaper with the most expensive Premier+ version costing $34.95. However, be aware that most online tax filing services such as TaxAct are very aggressive on the upsell encouraging you to upgrade from the free version and even lock-in prices for next years tax returns. The pricing model for TaxAct is slightly simpler than TurboTax and H&R Block. There are 3 versions of TaxAct – Free, Basic, Deluxe+ and Premier+ all of which are cheaper than the equivalents of the big two. TaxAct is also the only tax filing service that allows Mac users to file S-Corp taxes online via its TaxAct Online 2018 Business 1120S service although this costs $59.95. On Windows this is also available as a desktop app but Mac users can only use the online version. On the surface it looks like a pretty good deal with the same features as H&R Block and TurboTax. However the reality is that using it is another thing altogether. For instance, TaxAct claims that the Basic and Deluxe+ versions can import investments, 1099s forms, Schedule K-1s and PDFs but this often doesn’t work very well if at all. The number of financial institutions you can import from is also very limited, with even major banks such as Morgan Stanley not supported. Windows users have also found that if do purchase the desktop version, you can’t export all the data you’ve filled in online to the desktop app (although this isn’t an issue for Mac users as there is no Mac desktop app). TaxAct does provide a useful summary of deductions you can make although TurboTax and H&R Block are better at identifying deductions to maximize your refunds. TaxAct does the job but it’s not all as plain sailing as it should be. You can definitely save some up front cash buying TaxAct but in the long run, you’ll probably get more back in tax returns from TurboTax or H&R Block. OnePriceTaxes used to have a Mac app known as E-file Cloud but is now completely online. It’s a little known online tax software that’s a surprisingly good, albeit basic alternative to TurboTax and H&R Block. OnePriceTaxes.com was developed by a small team of computer programmers who were tired of the bait-and-switch, multi-tiered, tax filing sites. The result is an easy to use and affordable tax filing platform that provides a refreshing alternative to the big two of TurboTax and HR Block. OnePriceTaxes takes around 30 minutes to file all your taxes. You can complete simple or complex returns and include your state return too. OnePriceTaxes is refreshing because there are no confusing add-ons or hidden fees for specific types of taxes. It allows you to see what your tax refund will be before choosing whether you want to file Federal and State taxes online. After signing-up for a free account, you can start entering your personal information and tax data. The best thing about OnePriceTaxes is that it’s incredibly easy to fill in. Since there are none of the fancy features or setup wizards found in TurboTax and H&R Block, it’s very straightforward to fill in and use. Once you’ve entered essential information such as your name, address and social security number, you simply have to fill in information about any dependents you have, review your return with the estimated refund and then file online. OnePriceTaxes includes most return forms including small business Schedule C, Rental Property Schedule E and various 1099 forms. It does allow you to enter deductions but unlike TurboTax and H&R Block, it won’t help you maximize your returns or identify areas where you could be deducting more. If you’re not worried about maximizing your returns and know what you’re doing when it comes to deductions and which forms you need, OnePriceTaxes is a refreshingly simple and cheap tax software that anyone can use. W-2 and 1099: One handy feature of both TurboTax and H&R Block is that they both allow you to take a photo of these documents and import them into the software. If you’ve got these handy, it will make life easier whichever tax software you choose on your Mac ensuring that entering data is easy, transparent and structured so that you don’t end-up wondering if there’s something missing or if you’ve forgotten something. Aside from being prepared with the right documentation however, there are also a few other essential things to consider before deciding whether you should use tax software on your Mac. Most tax software is available in different versions depending on the type you need. These range from free software for Federal tax returns to more expensive small business tax software. It’s very important to purchase the right version to ensure that it supports the kind of taxes you need to file so you don’t get any nasty surprises afterwards. To make matters more complicated, with each tax season vendors such as TurboTax and H&R Block frequently change both the pricing and which versions support which type of tax returns. Watch out for tax software that claims to be “free” because they often don’t take into account state filing fees although the free version of TaxSlayer is free for State filing too. Does Your State Or Region Support Electronic Tax Filing? One of the obvious advantages of tax software is that you can file taxes electronically but some states or regions do not accept e-filing of taxes or returns completed on certain tax software. You should always check with either the software vendor or Department Of Revenue in your state whether the software you are purchasing supports electronic filing to avoid nasty surprises at the end of the process. Some States issue a list of software that they officially accept electronic filed returns from such as Minnesota which accepts H&R Block but doesn’t accept TurboTax for example. Other states such as Florida, Nevada, Washington, Texas and several more have had at some stage or continue to have, a policy against e-filing. Particularly after the TurboTax fraud scandal in 2015, it’s possible that less States will support e-filing with TurboTax so make sure you check before buying. Which Credits, Refunds And Deductions Are Supported? If you’ve made a big purchase (such as a hybrid or electric car) and are expecting a nice big refund for it, double-check that the tax software supports those kind of returns. Tax software vendors usually keep software updated annually regarding tax laws and what’s refundable or not but they’re not always bang on the ball so check with the developer first if you’ve made a major purchase. Finally, it’s also worth checking what payment methods the tax software accepts tax refunds such as check, bank transfer, prepaid debit card, credit card, savings bonds etc as some only support specific refund types. Check whether the software offers any guarantees regarding accuracy and audit protection. Both TurboTax and HR Block offer guarantees for both which gives you some support or financial compensation if you’re informed by by the IRS that there’s a problem with your return. Along with deduction maximization and general support, this is one of the major differences between paid tax software and free or online tax software. For instance, TurboTax’s Audit Defense feature means that in the case of an audit, an Intuit tax professional will take care of administrating an audit so that you can concentrate on other things. TurboTax also offers an accuracy guarantee that in case of any inaccuracies, it will pay any of your IRS penalties. H&R Block offers a very similar accuracy guarantee and free in person Audit Support which allows you to actually go to an H&R Block office and talk to someone face to face. Note however that neither TurboTax not H&R Block provide guarantees that you won’t be audited – they simply provide comprehensive backup and mediation if you are. If things go wrong when filing your taxes, it can be extremely stressful. It’s therefore a good idea to check opinions as to whether the software offers good customer support. H&R Block for example is excellent in this respect because you can go into one of its local offices and talk to a tax software professional about your problem. Intuit’s TurboTax support meanwhile is limited to phone support although you can live connect to fax professionals directly from TurboTax if you have any problems. However, if you’ve ever had to use Intuit’s Quicken live chat support, you’ll know that this can be a very frustrating experience. Don’t underestimate how valuable after sales support can be when it comes to the complexities of tax returns. If you want to use the tax software alongside your iOS device, both TurboTax and H&R Block have iOS apps which allow you to file tax returns direct from your iOS device or at least help you fill in your tax return by taking a photo of your W2. Both TurboTax for iPad and H&R Block for iPad now allow you to file from your iOS device and take photos of your W2. You can also file directly from your smartphone if you want although with mobiles generally less secure than Macs, it’s less advisable. Unfortunately there is no desktop software that supports small business and S-Corp tax filing on Mac. The desktop business editions of H&R Block and TurboTax are only available for Windows. However, the online version of TaxAct Online 2018 Business 1120S Service allows Mac users to file S-Corp taxes online. No tax software can replace a professional tax adviser or accountant for complex returns. If your taxes are complicated, we strongly recommend hiring a professional rather than going it on you’re own using software. It can be extremely stressful if you run into problems or uncertainty with tax software and for the time and stress it takes to sort out, you may even find a professional tax consultant works out cheaper and considerably less stressful in the long run. We can recommend The Tax Team as a good starting point if you need professional advice on your tax affairs. We prefer desktop tax filing software to online solutions because a single desktop purchase allows you to file multiple returns whereas online, you have to pay per tax return you file. However, online solutions often offer better pricing, easier to use interfaces and there’s no download or software incompatibility issues. It’s also worth noting that if you feel like you don’t need any help from tax software to file your tax returns, you can file online for free with the IRS Free File service. Depending on your financial situation and region, you may also be able to get free state tax preparation assistance as well. If you really want to try and squeeze every last cent out of your tax return, TaxSlayer makes things really simple. If you’re a fan of Intuit products such as Quicken, then you’ll probably be familiar with the TurboTax way of doing things. If you’ve had nothing but bad experiences with Quicken or would like the peace of mind of knowing you can visit a tax professional in person, you’ll probably find H&R Block is best for you. We like H&R Block most for the personal touch of being able to actually physically meet one of their tax consultants if needed. However, TurboTax now offer a similar service with TurboTaxLive although this only allows you to meet with a CPA online. If you want specialist advice on your fiscal situation without using any of the apps featured here, we can also recommend The Tax Team. If you have any questions, problems or suggestions regarding the software featured here, let us know in the comments below. For more on running a small business on Macs, check out our guide to the top CRM solutions for Mac users. First, you do not make a clear distinction between Canada and the US. For Mac users, the options for Canadian tax software is VERY limited. In fact, TurboTax and HRBlock software are NOT available in Canada for the MAC. Neither the TurboTax.ca nor the HRBlock.ca sites make this clear at all. NOTE: I have always used TurboTax (and QuickTax before it) in a VM (VMWare Fusion) so I have never used any of these other software so I cannot speak to their quality. It would be nice if you could do a review of these. P.S. Since you provide links for the Canadian versions from this article for Tax Software for Mac, it leads users to believe there are Mac versions of Tax software from these suppliers for CANADIANS when there is not. Yes, but they are Windows versions, NOT Mac. Neither has produced a Mac version in years. Thanks for spotting that – we should have highlighted that the Candian version of TurboTax for Mac CLAIMS to be for Mac, but is actually a web version. The same goes for Canadian version of H&R Block. Sorry your original comment came after your second comment but it’s now appeared above as you can see 🙂 We’ll take a look at TaxFreeway and TaxTron – thanks for the recommendations. Thanks for the tip – will take a look at it. So again I ask this question: Is there a tax program for MAC that will do S Corp taxes? You talk about the pros and cons of H&R Block and TurboTax, but NEITHER of those Business programs run on MAC. Is there ANY TAX PROGRAM for preparing and filing S Corp taxes available for the MAC? Unfortunately not anymore but you can use the online versions of TurboTax or H&R Block plus some of the other online tax filing services featured in the article. i actually don’t see any online Turbotax Business option for S-CORP that is online. For macs. I’ve tried searching all of turbo tax website for it. Also, in the article, you don’t mention specific online software for Mac for S-Corp. Please advise. The only service that allows Mac users to file S-Corp taxes online is the TaxAct Online 2018 Business 1120S. This is also available on Windows as a desktop app but only available online to Mac users.